CLS hosts a seminar series that aims to trouble normative conceptions of law in society, drawing on the thinking and experience of legal practitioners, scholars, activists and prominent social commentators. With students as its primary audience, the series, titled With(Out) Law: Critical Conversations on Law in Society, offers provocative inputs and lively exchanges that aim to productively engage with the role of law and its impact on contemporary social justice issues. On 23rd May 2018, CLS hosted speakers, Dalli Weyers (Social Justice Coalition), Mandy Mudarikwa (Legal Resources Centre) and Adv. Bronwyn Pithey (Women’s Legal Centre), for an exploration of themes under the question of how the law can be used in support of activism, and what challenges are likely to emerge. The conversation engaged with several issues including activists resorting to judicial over-reliance and accessing the law in the absence of effective policing. 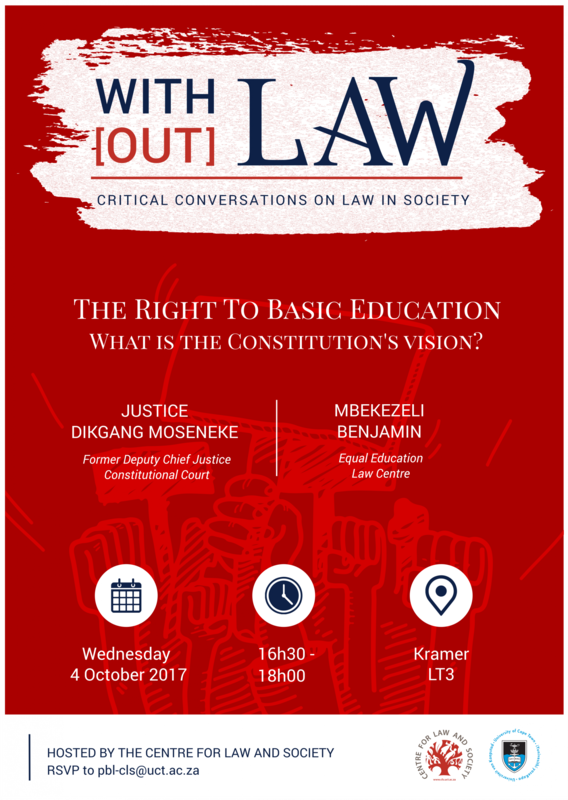 On 4th October CLS hosted former Deputy Chief Justice Dikgang Moseneke as he engaged with Mbekezeli Benjamin (Equal Education Law Centre) on the various dimensions of the Constitution’s vision of the right to basic education and its implications on the realisation of this right. 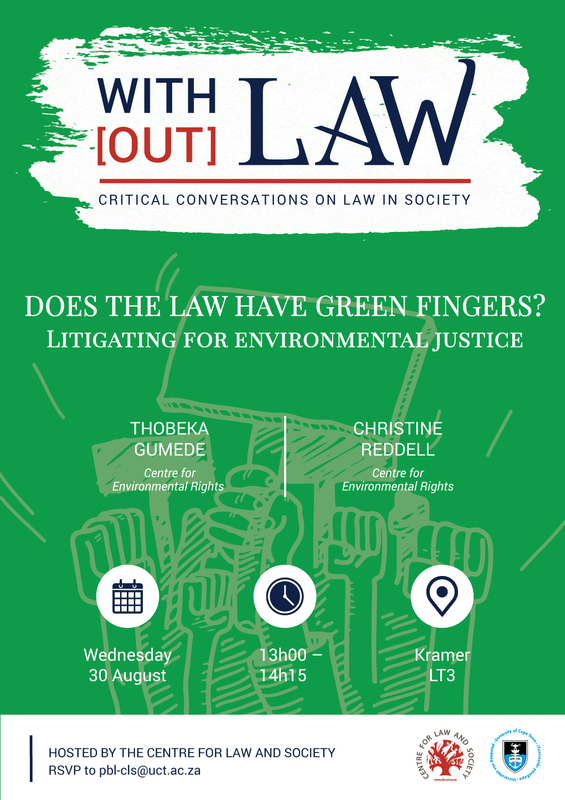 On Wednesday 30 August CLS hosted Thobeka Gumede and Christine Reddell from the Centre for Environmental Rights for its With(Out) Law Conversation: Does the law have green fingers? Litigating for environmental justice. The discussion centred around reflections on the successes, challenges and limitations of using law, alongside other supporting strategies for social change, to advance environmental justice in ways that have material effects. 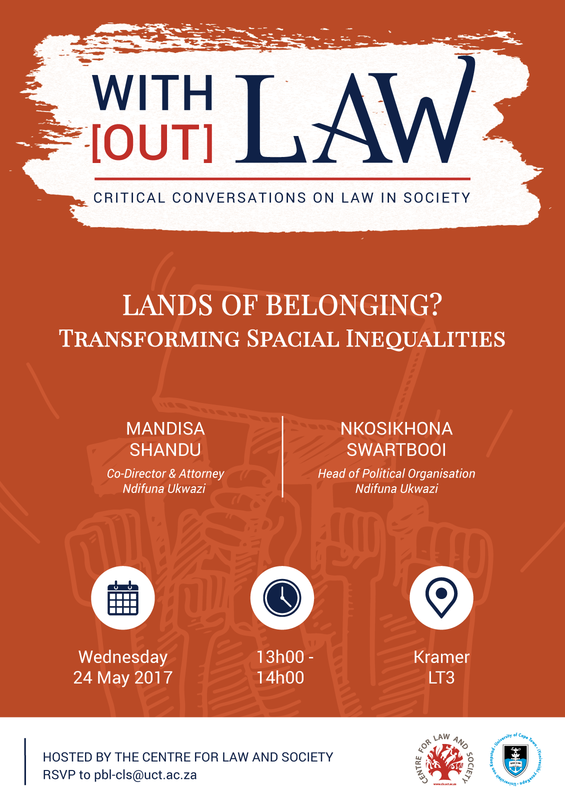 On Wednesday 24 May, at the third installment of the CLS With(Out) Law series, Mandisa Shandu and Nkosikhona Swartbooi, from Ndifuna Ukwazi, were the guest speakers at the seminar entitled: Lands of Belonging? Transforming spacial inequalities. The speakers drew on NU’s direct experiences with the Reclaiming the City campaign, and reflected critically on the relationship between spatial injustices, belonging, and demands for more equitable urban housing, planning and development. 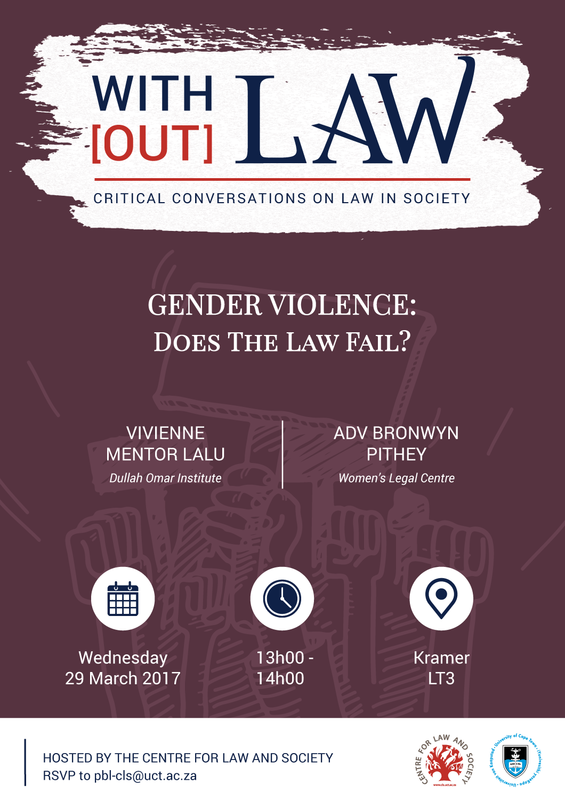 The second seminar in the With(Out) Law series was held on Wednesday 29 March on the topic: Gender violence and the in/applicability of law, with speakers Vivienne Mentor Lalu, from the Dullah Omar Institute and Advocate Bronwyn Pithey, from the Women's Legal Centre. The purpose was to generate critical engagement with the potential and limits of national laws and policies and their applications, in addressing gender-based violence in South Africa and on university campuses in particular. The first of the CLS With(Out) Law conversations, entitled ‘Turning to Law: Perspectives on Legal Activism for Social Justice’, took place at the Bo-Kaap Museum on 10 December 2016 and featured Mandisa Shandu (Ndifuna Ukwazi Law Centre), Nurina Ally (Equal Education Law Centre), Kerry Williams (Webber Wentzel) and Amelia Vukeya Motsepe (Senior Legal Consultant). Facilitated by CLS’ Research Associate, Melanie Judge, and with an audience of local and international visiting scholars, this excellent seminar looked at how NGOs have been effective in using the law to work towards the defence and advancement of socio-economic rights in South Africa. 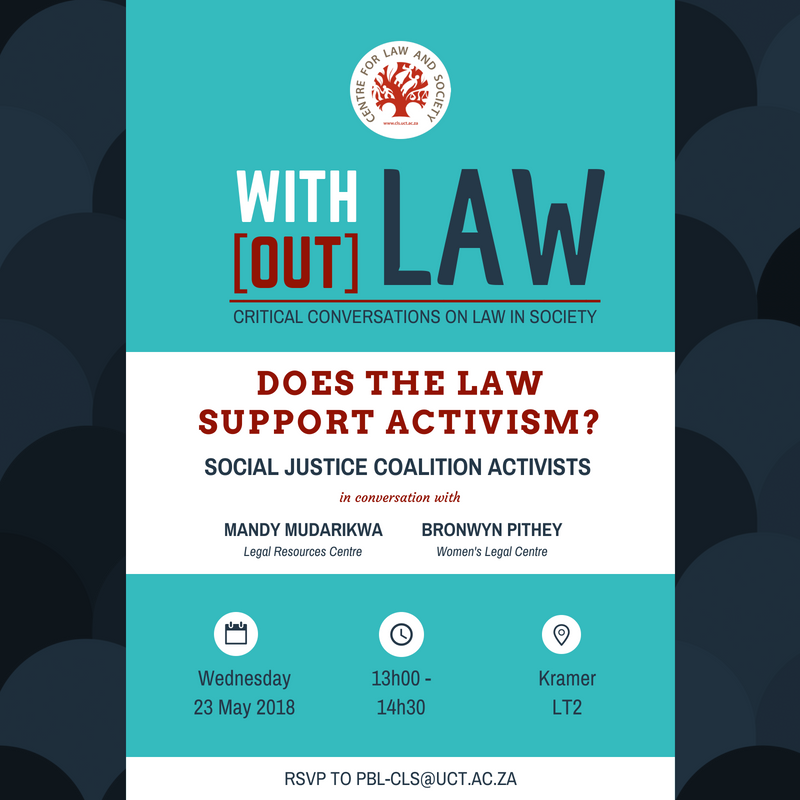 The conversation engaged with the limitations and potential of legal activism in effecting social change towards an equitable and just society and reflected on gains that have been made through the use of the law.